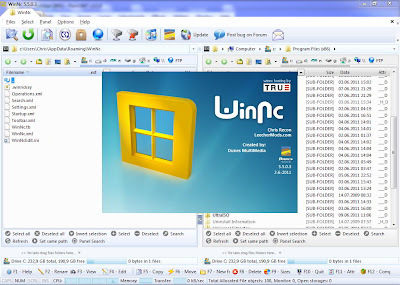 WinNc is a tabbed file manager especially developed for Windows 7. It also works on the older versions of Windows. This NC clone file manager is inspired on the dual panel concept of the old file manager Norton Commander. It has shortcuts to all the Windows 7 special folders and the multiple tabbed interface allows you to organize your data by projects. Projects can include files and folders that are related to the project. Quickview - Quickview uses WinNc's internal to view the selected file in the other panel. Editor - Editor for textfiles. Zip and Mailto function - Select a number of files and/or directories you would like to zipped and then mailed. Calculate Size - Calculates the total size of the selected files and directories. Encryption - You can secure your files using the WinNc encryption method. Print - Prints all the selected files using their host application. Compare directories - Here you can compare two directories. Compare files - Here you can compare two files. Synchronize - Synchronizes including subdirectories. Compare Text Files - Compares two text files. Find Files - Here you can search for files using wild cards and search strings. Format Disk - Formats a floppy drive. Connect Network Drive - Connects a network drive as a drive-letter. Create self-extractor - WinNc can create a self-extracting file from a zip-file. This self-extractor can easily be used by users not familiar with Winzip, WinNc or Pkzip. Fix Corrupted Zip File - Tries to fix a corrupted zip file. Split Files - WinNc can split (big) files and merge them. This way you can easily transport large files on floppy (1.38 mb) or by email (e.g. 2.72 mb). You can also use the BAT file WinNc created. The batch (BAT) file can be run on any other machine. WinNc does not need to be installed for a batch merge. Compress wav to mp3 - WinNc can compress WAV or directly to MP3. Extract CD to mp3 - WinNc can rip (extract) audio cd and encode them to WAV or directly to MP3. Play mp3 Selection - WinNc can play playlist in the Winamp format. Create mp3 playlist - WinNc can create playlist files in the Winamp format. Create Backup - Simple but effective backup from the files in the backup list. FTP - WinNc is able to copy, move, etc files to a machine / webpage connected to your network (intranet) or to the Internet using the "File Transfer Protocol"
CD-Burn and DVD Burn - WinNc.Net is able to burn cd's and dvd's data compilations. Audio feature will be available in the future. WinNC average Memory usage is about 55 MB and need 50 MB disk space. With WinNC it is much more easy to handle all the files on your Harddisk, Network drives and FTP. The Program Language can be switched in 18 Languages and 11 beautiful Themes comes include. 15 Personal Licenses are available for our readers with product updates for 5.x and full support. Follow us on Twitter and share this article with your friends on Facebook or Twitter and post it on your Blog/in Forums and include the share link in your comment. A click on "Like" on our Facebook Page will be very appreciated! Make sure you subscribe to our Newsfeed and have your email confirmed. The Licenses will be send to the winner from Winnc.net. We forward the winners email addresses include the Names for the License to Dunnes MultiMedia. We draw on 14. June random the 15 winners and announce them. Visitors who do not fulfill the requirements are excluded from this GiveAway. Many thanks to WinNc - Dunes MultiMedia! thanks guy... can you count me in?? Great giveaway. I really need a good replacement for windows explorer, and this program is surely what I want. very very good software! thanks leechermods for this nice giveaway! A very good program for file management! Great giveaway. i am using xplorer2 all this while and very happy with it, a pro version for this would be great. Nonetheless, I shall give WinNC v5 a try. The new interface and multitab features look good. Other features I like is the build-in-search, compare files and sync. thank you for this great software giveaway, please count me in, i would like to use this newer norton commander, make me remember my dos times.. I want to test this multiple-tools.. Very good program. Count me in. Thanks for this fine software and has many good features that lacks windows explorer. One of the best windows explorer alternative. http://twitter.com/#!/sysabi/status/79232604636852224 I have sentiment to Norton Commander since I used this software in DOS system! I hope I win a one license! Handy when windows explorer crashes also will let to see where the space is gone and to track junks and duplicates. Thanks for this Giveaway sir.I want this soft.Please count me in. Very good soft so count me.. i hope that post in my own blog will be enough 'cause i don't have twiter or fb account..